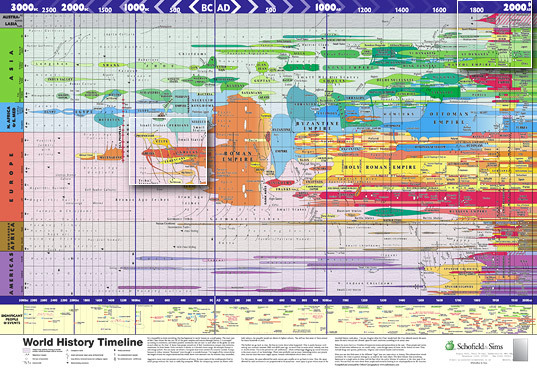 The World History Timeline Poster from Oxford Cartographers provides a colourful, detailed, geographical (vertical axis) overview of World History and civilisations from 3000 b.c.e. to 2000 c.e. (time, horizontal axis). The elevated parts of the diagram show close-ups. In terms of the logarithmic scale of deep time, historical time is briefer than Quaternary time, but longer than immediate or personal time. It is generally taken to encompass the five thousand years of recorded history and socio-cultural evolution, from ancient Sumer and Egypt to the modern day. here society is distmnguished by social innovations such as writing, commerce, monarchy, priesthood, and the standing army , and takes in everything from the early city-states of the Bronze Age Near and Middle East, through the rise and fall of empires, the printing press, and the steam engine, and such social innovations as commerce, monarchy, the church, and the standing army Here 3000 b.c.e. (b.c..e = before the common era, a term we use in prefernce to B.C.) or 5000 ya (years ago) is an arbitarary cut off point (one can go back further to the Chalcolithic and the first cities such as at Catal Huyuk, but there history has given way to archeology), although it is also interestingly a bit under one hundred thousandth of the span of the Phanerozoic, and just a little over one millionth the age of the Earth and the Solar System.